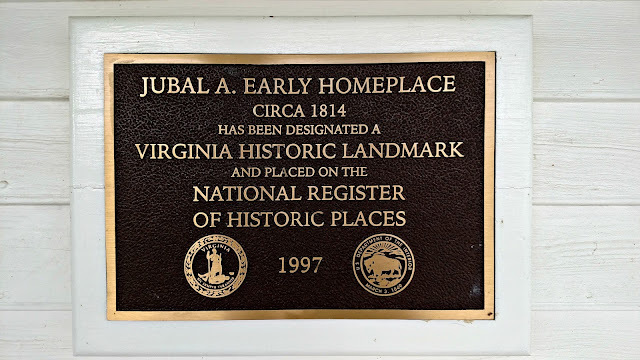 The Jubal Early homeplace isn't far from us, but it's only open on Sundays from 1-5 so we've never had occasion to stop. The other weekend we were driving by at just the right time, and in no rush, so we decided to check it out. 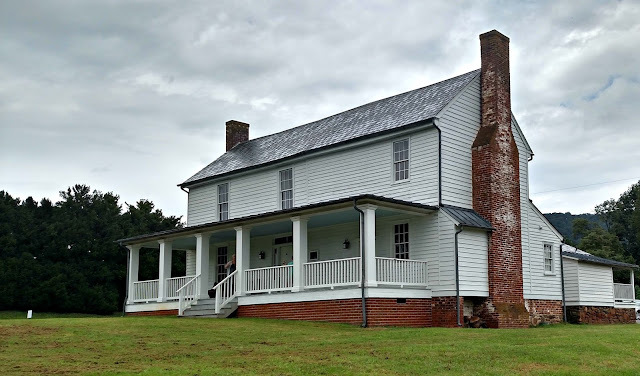 Built in 1814, it is one of the oldest Federal style houses in the region, and I have always been a sucker for exploring old houses. The right half is original (and it was done in the Federal style - only one room upstairs and one room downstairs initially). The left section was added about 30 years later and was done in Greek Revival style. Jubal Early was a lawyer and Confederate general in the Civil War. He was a bit of a scoundrel; well known for his foul language and shenanigans. The boys were enthralled by a story during our tour of how he once hid in a space behind the kitchen chimney (behind the house, so you cannot see it in this picture) to avoid arrest. We were the only folks there on the day we went, so we got a private tour. I especially loved seeing the pictures of the house when the caretakers original bought it back in 1996 - it was a crumbled disaster. They really have done a remarkable restoration of it. They were able to retain the original flooring, as well as mantles and fireplaces. You might not think touring an historic home would be fun for kids, but the boys were legitimately interested and asked a lot of questions. It was a fun way to spend a rainy afternoon, and we learned some new facts about history along the way. So glad y'all were able to explore and the boys enjoyed it. Love places like that with history. 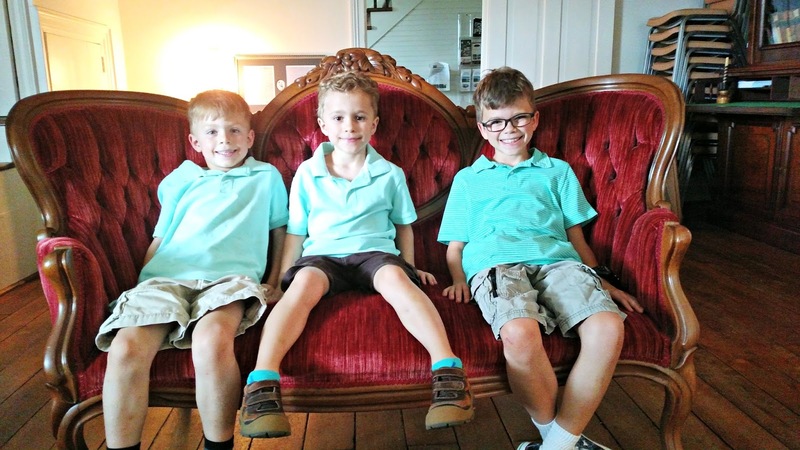 The 3 boys are smiling and happy! I read Early didn't get along well with Stonewall Jackson. Makes sense if Jackson was a huge bible thumper and very non-scoundrel sort. I published a new blog post today. Check it out when you have time. LOVE this picture of the boys on the Victorian style couch!! I love touring houses, but am limited because I can't go up the steps. This place is beautiful! Best of all is that porch!!! It needs white wicker furniture, mint juleps, and plants. Did you find out anything about the people who bought it? How wonderful that they did! local history tours are fun! LOL...the boys would love it. Those boys are growing up! Nice trip, I love exploring the old homes too. I would love to visit. I like things like that. What a beautiful building and the two sections are very interesting. I would thoroughly enjoy touring this home and hearing the stories. What a great photo of your sons. My nephew always loved touring historic homes/buildings when he was young. it's always great to visit historical site like this..